My house is messy. My children struggle to get all the food that sits on the end of an eating utensil actually into their mouths. We don’t have a dog, so what falls off the fork, falls to the floor and stays there until someone sweeps it up. They create dishes and dirty clothes. They accumulate stuff and conspire with each other to make sure that each room has some random article haphazardly thrown on the floor. We get it cleaned up. They help me, and with the three of them at an age where they can competently, I mean effectively…well, they get it cleaned up, it is only as bad as I let myself think it is. 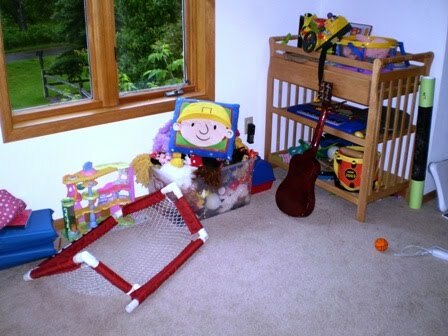 When our oldest was the only baby in the house, I would follow him around and literally put the toys back in the toy box as soon as he dropped it and crawled on. With the addition of each kid, I realized that I was trying to hold back water equivalent to a tsunami. I gave up the perfectly clean house idea. Similarly, I didn’t fight the sparrows this year. 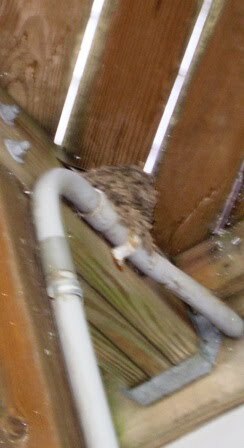 Every summer that we have lived in this house I have waged a backyard war against the sparrows who like to build nests under our deck. They would carry in mud, I would smack it down, they would carry in more mud, I would smack it down. I would walk through the back yard with my smacking stick and they would dive bomb me to let me know that I sucked. I would win, and the birds would abandon our deck…all in the name of keeping it clean. I’m not sure why I’m going soft, but I let the birds in this year. 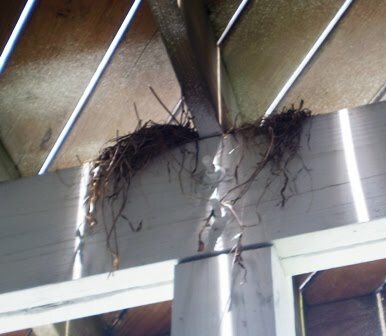 There is one sparrow’s nest and two other nests that likely belong to some of the robins who hang around. It’s messy. They aren’t always accurate in the nest building, and I did have to sweep some of the mud off of the patio. 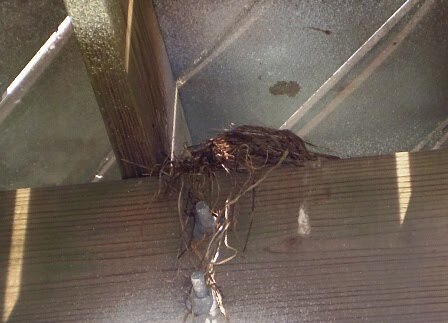 What I had unknowingly prevented in previous years, though, was an aerial show that not only captivates Little Sprout, but I too find myself sitting under the deck, fascinated by the comings and goings of our new house guests. Little Sprout is the one who took these pictures, and because she was using my camera, I couldn’t capture the way she tiptoed around the patio, startled each time a bird would poke out of the nest and then swoop down past her. She was so excited. There are other messy things outside. Planting flowers and collecting what they and the trees shed is messy business. I’ve concluded anything that has life leaves behind a mess to be cleaned. Don’t get me wrong, I look forward to the days when I can confidently update our house, paint the walls and outfit the floor because I know that the children are less careless as they carry their things through the hall. I know my house will be clean and beautiful again some day. I’ll be sad that it is no longer messy. I may just keep a box of random things and occasionally spread them out on the floor, because I know when it looks like that, our house is full of life. I’ll miss that when it’s gone.